Olio kitchen & bar provides quality relaxed dining, using the best local ingredients. We totally enjoyed our dinner @ Olio & have already recommended your restaurant to family & friends. Our meals were absolutely delicious & the service impeccable. We’re not Brisbane residents, but will definitely return next time we are in town. Wonderful meal and exceptional service staff. Thank you. Great food and the staff were very attentive and helpful. Had a great table outside and the atmosphere was buzzing. The wait staff were so hospitable and accommodating to us. Meal portions were a little small but fills you up. We thoroughly enjoyed our delicious lunch at Olio ... the excellent food, great service, and cool comfortable atmosphere on such a hot Brisbane day made it the perfect place to dine. We'll certainly be back. 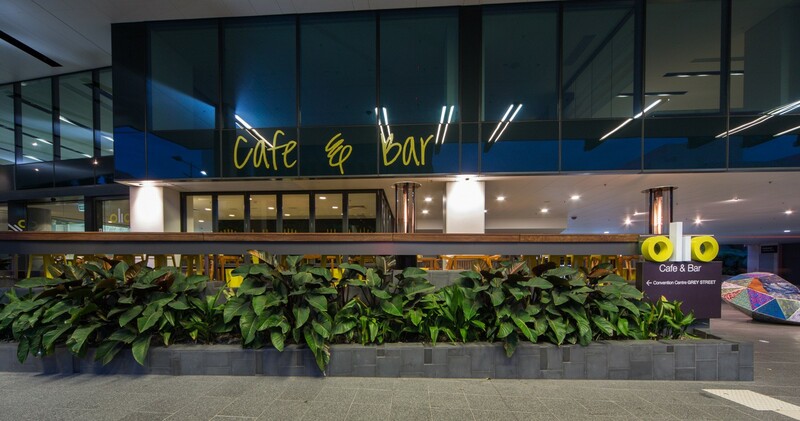 We are always happy with the food and service at Olio before QPAC events, and the discount parking is an added bonus! Tasty  reasonably priced food. Quick friendly service. Location is perfect for the Theatre. The wait staff are extremely friendly and helpful. The food is delicious. The bonus is the validated parking at the Convention Centre carpark. A great pre show dinner venue!! The service was wonderful and the food was delicious and great value for money. Brilliant as usual. Best pre-theatre venue in Southbank. Period. Lovely venue, easy to order and best sourdough bread we've ever tried. Thank you. Please thank the chef and staff for providing me with a gluten free steak meal ( not as on the menu ) and for checking my coeliac status before serving. Excellent food and service. Thank you. The park and dine special is great for a pre theatre dinner. The service is great, the staff are friendly and attentive. I have dined here several times and keep coming back. I had the lamb and parfait as part of the great value park and dine deal. The food was superb. I'll definitely be back. We had a great meal at Olio - location is perfect and everyone at the table enjoyed their meals. Great service and compliments to the chef! Lots of staff that looked busy but you couldn't get their attention so we couldn't figure out if it was order at the counter or table service. 1 meal was missed. Risotto was way too salty. Service very hit and miss. We had an amazing meal and were really pleasantly surprised on the quality of food.. and the service.